Here is a rather groovy graphic (OK, it's groovy for an academic paper) summary of a paper I was involved in writing, which came out in Maternal and Child Nutrition last year. Hoddinott, John, Harold Alderman, Jere R. Behrman, Lawrence Haddad, and Susan Horton. 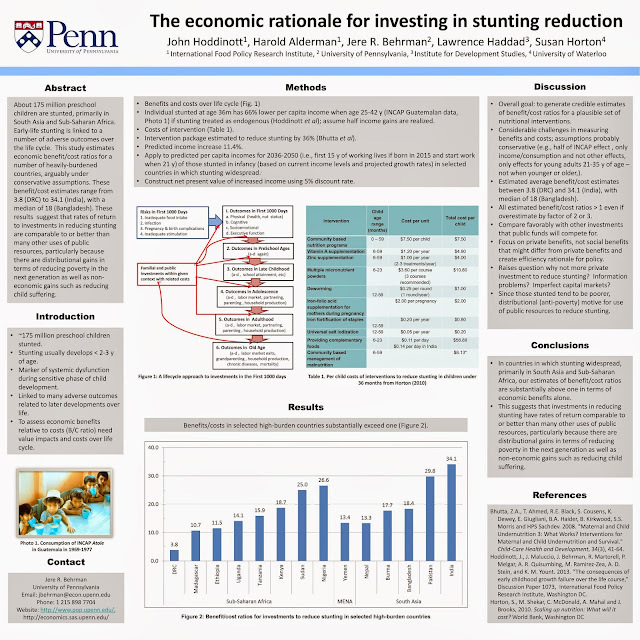 "The economic rationale for investing in stunting reduction. "Maternal & child nutrition 9, no. S2 (2013): 69-82. It might be useful in your advocacy efforts. Do you by any chance have a higher resolution version of this image? It's great, but it prinmts fuzzy for me. are you downloading it from scribd at the link I gave? by example - and perhaps by excitement, by having productive ideas to make others feel involved.